This lesson describes current and future satellites sensors and products used for monitoring the fire cycle, with an emphasis on polar-orbiting satellites. Product information is presented in the context of the fire lifecycle: from assessing the pre- and post-fire environment to detecting and monitoring active fires, smoke, and aerosols. Product information is also consolidated in the Fire Product Suite. The lesson concludes with an interactive fire case study, supplemented with observations from a National Weather Service trainer/forecaster who experienced the fire. The lesson is intended for the wide range of users involved with wildfire detection and monitoring, from land use managers and hydrologists to weather forecasters and researchers. Note that this lesson is an update to the original 2007 version and includes new information on the VIIRS and upcoming GOES-R sensors and their fire-related applications. If there were audio elements, I missed them. A good, basic introduction to what satellites can (and can't) do for monitoring wildfires. Demonstrate the advantages and limitations of using multi-sensor, multispectral analysis for monitoring the fire cycle. 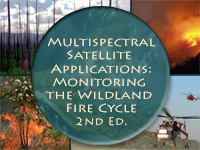 Describe some of the remote sensing products and systems used for detecting and monitoring the wildland fire cycle. For each product, identify its capabilities, limitations, and applications. Identify the common thermal emission regions used to detect fires in both polar-orbiting and geostationary satellites. Identify the capabilities and limitations of geostationary vs. polar-orbiting satellites, shortwave vs. longwave imagery, and true vs. false color products in detecting and monitoring the fire cycle. Identify the essential steps in automated and semi-automated smoke forecasting.